I had trouble in understanding how to read the tyre sizes that are marked on the side of the tyre. But the Internet came to my rescue. The first number, "205", is the width of the tyre tread, in millimetres. The next number after the "/" character, refers to the profile of the car tyre, printed as a percentage of the width of the tyre tread. For example, using the tyre details above, the width of the tyre tread is 205 mm and the profile is 70 (70%). Therefore the profile of this particular tyre is 205 mm x 70% = 143.5 mm. The last number after the "x" character, refers to the diameter of the wheel in inches. So the wheel in our example is 14 inches in diameter. However, there are some exceptions. The profile of a "standard" tyre is 80, (ie. 80% of the width of the tread). Some tyres, especially those fitted on older vehicles, don't display the profile number. So you might have a tyre showing "165x14". If the tyre profile number is not printed on the tyre sidewall, you can assume it is a standard tyre, with the profile number 80. The other exception is that some tyres have their tread width stated in inches instead of millimetres. But to cause a little confusion, these tyres are printed with either "4.00" or "400" if the tyre tread width is in inches. For example you might have a tyre showing "400x17" or "4.00x17". 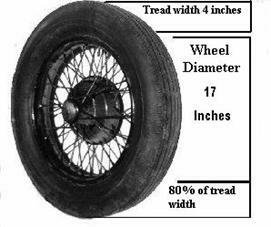 These both mean the tyre has a tread width of 4 inches, a standard profile (80) and a wheel diameter of 17 inches. This article, written by Mike Easton, appeared in CA7C Seven Focus in Mar 2004 p9.